How to Use Umbrellas for Wedding Decor in a Fun, Quirky and Chic Way? No, we’re not talking about the black contraptions that lie around in sad looking bins next to the concierge at a hotel lobby or outside a banquet hall, for the rainy days. 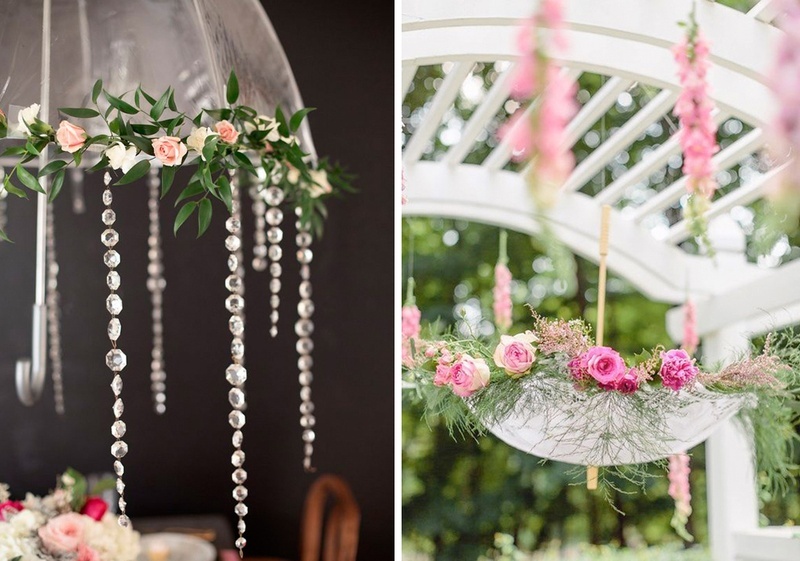 What we’re talking about are umbrella installations that make for stunning wedding décor. Never seen em before? A big trend in wedding décor, all kinds of creative renditions of this useful household item as colourful décor props has taken over the wedding décor industry by storm (no pun intended) Add color, flavour, fervour and fiesta to your Indian wedding décor by adding bright and cheerful umbrellas. Don’t think dull and boring colors, nylons and plastic. These babies now come in all kinds of shapes and sizes, from zardozi to mirrorwork, from rice paper to handmade paper, calligraphy and bamboo to lace and scallops, your imagination is the limit. Whether you’re having a beach wedding, an outdoor garden wedding, a poolside wedding, a summer bridal shower, outdoor mehndi, sangeet or a monsoon wedding, given the flexibility of these umbrellas they can fit in any and every setting helping you create a fun tropical theme. Float your guests away in a romantic atmosphere by installing umbrellas for wedding with lighting, unusual designs and shapes. To help you brighten up and uplift your wedding celebrations, we give you some fun, quirky and chic suggestion on how to use umbrellas for weddings. Take a look. Give your wedding a whimsical look, hang these colourful umbrellas upside down. Try out different patterns and mix of colours to add more intensity. Create your own little chandeliers or give some shade to the beautiful flower vase setting - either way they look stunning. Cover a plain wall with tiny colourful paper umbrellas or create a wall of umbrellas with shades one colour or better yet create a life-size frame with umbrellas – whatever way you like it, super cool pictures are guaranteed. Drop it in your drinks! As cute giveaways for bridal shower throw in some sweet treats in handmade paper umbrellas. If having an outdoor sangeet or mehndi function, gift your guests Indian designed umbrellas or parasols if looking for a fancy option. Umbrellas make a great prop for photo shoots too. Be it pre-wedding or wedding photography, a lot can be done with colourful and distinctly shaped umbrellas. Some quirky and fun ideas we give you here. Create your own floating umbrella street like the one seen over promenades in the streets of Águeda, Portugal and get mushy or quirky with your poses. Match your umbrella to your outfits to maintain consistency and create magical and impactful captures. Or whisk away with your spouse-to-be and create a timeless capture like this reliving your true moments before or on the D-Day. Let us know what you think about these cool inclusions of umbrellas in your wedding celebration. Have more fun suggestions? Write them down in the comments section below.